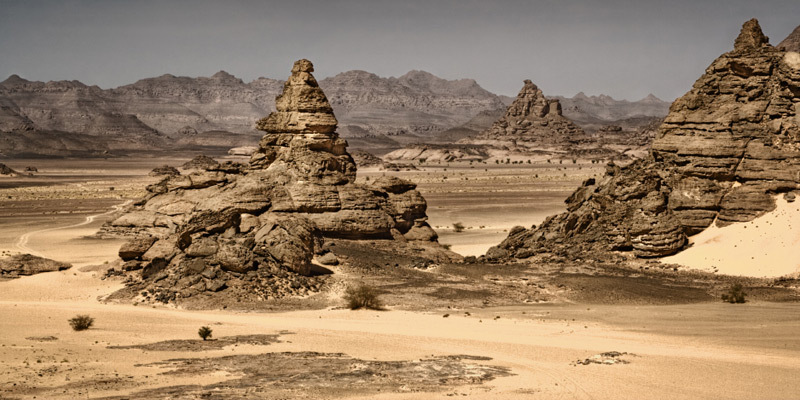 The Boulivar Flats is a desolate rocky region with little vegetation. The region is cold, damp and flat. Brackish pools of stagnant water and bubbling hot springs are scattered throughout the region. These small bodies of water form pockets of mist that dot the landscape. The Boulivar Wastes, as they are sometimes called, are located in a valley region that connects Magrakor and Eshtar. It is possible to travel between those two nations by traveling through the Boulivar Flats. The Boulivar Flats is a stagnant valley region with poor soil and foul water. The air is filled with noxious fumes. There is nothing of value here and neither the Magrakians or the Eshtari wish to settle here. The Flats are home to several hermits. The Boulivaran mountain goat is an indigenous hoofed herbivore with large horns. These small goats are very fast, sure footed and able to survive on the meager plant life in the region. The Boulivaran rock lynx is a small, fast feline predator that hunts the rock goats. The rock lynx stands about 65 centimeters tall at the shoulder. It has a dull grey coat that blends in with the rocky terrain. Rock lynxes are capable of very fast short range sprints. Both of these animals have excellent eyesight.